Robert E. Howard Days: Howard Days 2018 is June 8th and 9th! A New Year brings us a new Howard Days! The 2018 version of Robert E. Howard Days takes place on Friday and Saturday, June 8th and 9th, at the Robert E. Howard Museum in Cross Plains, Texas. Once again, fans from all over the world will gather to celebrate the life and legacy of the incomparable Robert E. Howard! 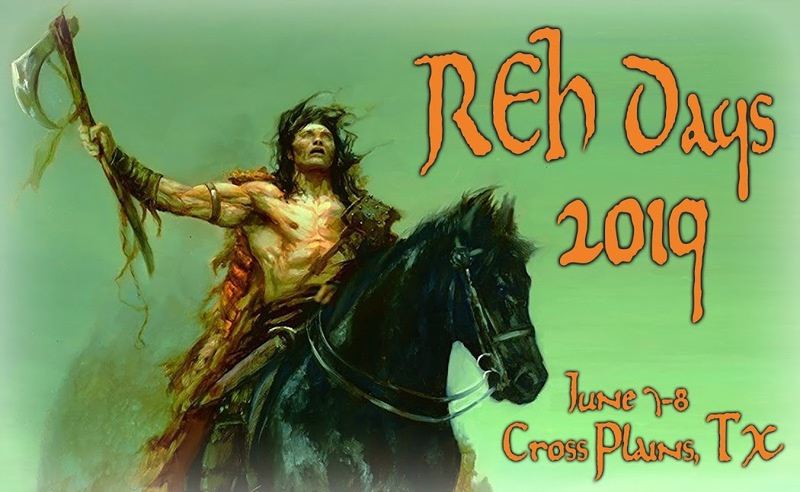 Project Pride of Cross Plains, along with the Robert E. Howard Foundation and REHupa, the Robert E. Howard United Press Association will be your sponsors and hosts once again. This year, we will celebrate members of all three of these organizations, along with the hundreds of REH fans from all over the U.S. and the world with our Howard Days theme of CELEBRATING REH FANS. Our Guest of Honor for 2018 is one of the mainstays of Howard Fandom, "Indiana Bill" Cavalier. Again this year, Howard Days attendees will enjoy the fellowship and camaraderie felt by REH fans from all over the world! The Robert E. Howard Museum and adjoining Alla Ray Morris Pavilion are the gathering points and will be open to all (at absolutely no cost)! All of our regular activities will be in place: Tours of the REH Museum and grounds are ongoing; a Bus Tour of Cross Plains and environs takes place Friday morning; a Hot Dog Lunch, the Celebration Banquet and a honest to Texas Barbeque feast will keep you fed; numerous panels, seminars and demonstrations will feed your fannish and intellectual curiosities; you can marvel at Original Howard Manuscripts on display at the Cross Plains Public Library, you can acquire REH books, comics, magazines, t-shirts, hats and souvenirs in the Museum Gift Shop; the Robert E. Howard Foundation Press will be set up to sell true text Howard books; there will be a special REH Days postal cancellation stamp at the Cross Plains Post Office; and, we will have a small Dealers Area adjacent to the Pavilion this year. Plus, we promise to have a surprise or two to make things interesting! We are in the process of getting our panels. scheduling & registration and logistics lined up to give you another great experience at Howard Days, so please stay tuned to this page as well as our Howard Days and REH Foundation Facebook pages. It's never too early to start planning to join in all the fun and fellowship that Howard Days can provide for you, as we Celebrate the Fans of Robert E. Howard! Y'all come! And we promise that Cross Plains will be thawed out come June!